Despite the gray skies and snow flurries this week, the earth is starting to turn green again! (And no, I don't just mean the leftover St. Patrick's Day decorations - I've seen grass growing and daffodils blooming!) Frolic with Rhonda of Paint Brushed Boutique and the Treasury Island team through the forest. Woodland gifts include wood nymph green eyeshadow by Body Language Soaps, green elf ears by Dragon Nymph Crafting and my tree sprite magnet! Cool! Just posted my Tea Time treasury! Thank you so much. Wow !This is amazing...would love some kind of idea, of how it works...,and how I can help...The energy here is GLOWING ! Thank you so fairy much, Charles! 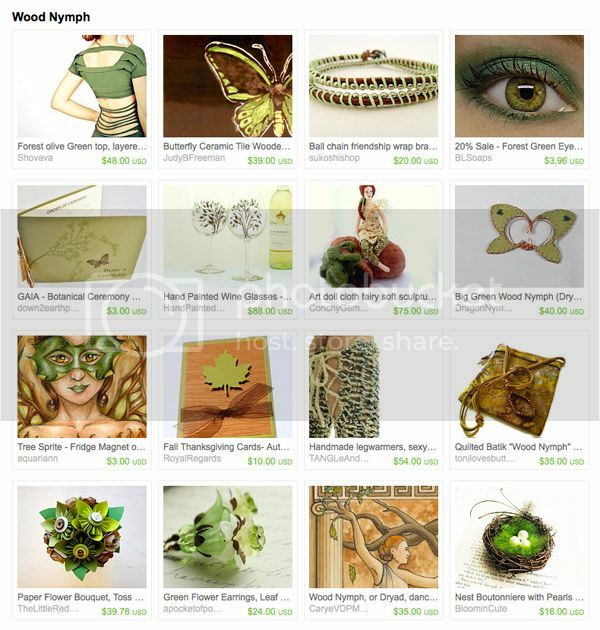 The linky is for treasuries only, so I replaced your shop link with the most recent treasury that features your work. Gorgeous collection! Thank you for allowing us to link up! I really love the shades of green you selected! I love these! Great finds! What a sweet thing to do, letting us share Treasuries! You are a Peach!